SEVIS by the Numbers is a statistical breakdown of the (SEVIS) system’s performance and trends in foreign student representation in US academic and exchange programs. Below is the “latest” SEVIS by the Numbers update. (Note: The PPT file has since been removed from the SEVIS website.) What used to be quarterly updates appear to have changed to biannual updates, if the September report is any indication. Many of us who follow these trends actually prefer the quarterly updates to the annual Open Doors reports on international academic mobility, which use data that are already a year old. 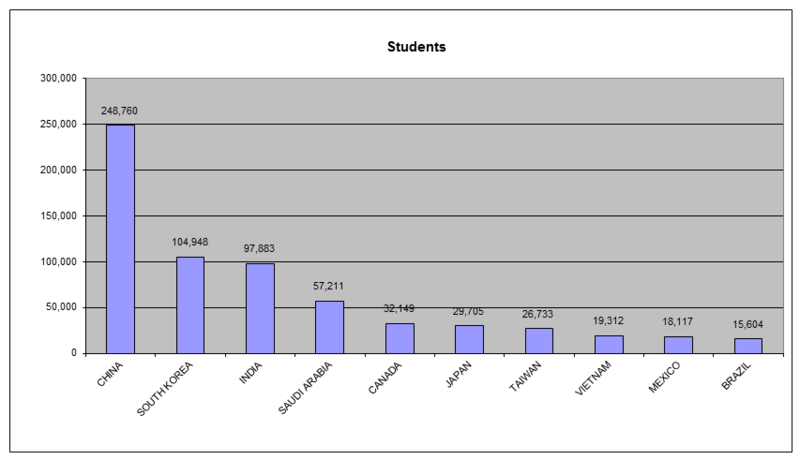 On 1 October 2012, SEVIS (Student and Exchange Visitor Information System) contained records for 1,275,285 active nonimmigrant students, exchange visitors, and their dependents. The total number of records for all F-1, M-1, and J-1 visa holders has increased to approximately 10.1 million. There are 44,203 international students enrolled in secondary schools, including a sizable number from Vietnam. Vietnam enrollment increased from 18,537 in March 2012 to 19,312, a 4% increase. Vietnam continues to lead the third tier of “top ten” schools (8th) with more students in the US than Mexico (9th) or Brazil (10th). My guess is that will surpass Taiwan and Japan in the next five (5) years. China continues to have the highest number of active students (248,760), a 23% increase in two quarters. South Korea remains a distant second with 104,948, a slight decrease over March 2012. India is not far behind with 97,883, also a slight decrease. Business continues to be the leading major for international students (192,628). 70% of active students are enrolled in bachelor’s, master’s or doctoral programs. California (159,407), New York (113,043), Texas (68,492), Massachusetts (57,275), Florida (43,090), Illinois (42,026), Ohio (30,465) and Pennsylvania (39,761) host 58% of all active students, a 3% increase over March 2012. California, Texas, and Washington enroll over 50% of all Vietnamese students. Of SEVIS-approved schools with active students, the visa distribution is as follows: 83%/F, 11% F/M and 6%/M. Of the top five F-1 and M-1 approved schools three are community colleges: Cornell University (5,046), Santa Monica College (3,572), Houston Community College System (3,443), the University of Iowa (3,073) and Northern Virginia Community College (2,198). The top five F-1 approved schools are CUNY (9,885), Purdue University (9,517), USC (9,397), University of Illinois (8,901) and Columbia University (8,579). The top five schools with active students on a M-1 visa are: Bethel School of Supernatural Ministry (683), TransPac Aviation Academy (378), Orlando Flight Training (288), U.S. Aviation Academy (211) and the IASCO Flight Crew Training Center (204). As I mentioned in my last two SEVIS updates, the Bethel School of Supernatural Ministry, whose slogan is Your kingdom come… on earth as in heaven, and which doesn’t appear to be accredited (dear reader, please correct me if I’m wrong; only God is perfect), “is committed to the truth that God loves people, gave Himself for them and has given His Church supernatural power to bring individuals and nations into wholeness. God is in a good mood! Inaugurated in 1998 with 36 students, the school emphasizes that believers need to return to the ministry of signs and wonders—to minister in love, truth and the power of God. The mission of BSSM is to equip and deploy followers of Jesus Christ who passionately pursue transformation in their God-given spheres of influence. In the 2011/2012 school year, more than 1500 students were trained to continue in the ministry style of Jesus: to enjoy the presence of God, say what He is saying, and do what He is doing,” according to its website. 60% of all international students in the US are studying business management, marketing and related subjects (28%), engineering (19%) and basic skills and developmental/remedial education (13%).